As a mobile developer, you may find yourself with a design that calls for sliding, animated, background-image carousels. In this article, I will review some of the existing documentation for implementing a carousel in Flutter, and fill you in on the information gaps so that you have everything you need to get started! As shown above, you will need to add “carousel: ^0.1.0” directly under the flutter SDK dependency. This communicates to the app that you want to add carousel version 0.1.0. The caret (^) prefix indicates that minor patch updates to the specified version are permitted. You can read about the caret prefix here. Next, run flutter packages get. If you are in Android Studio, you can do this by clicking the hyperlink that sits directly above the pubspec.yaml file. Note that you must be viewing this file specifically to run packages get. You can go ahead and run the app at this point to ensure that everything is working as expected. In Android Studio, this is done by clicking the green play button. Once you have started the app, you can press command+shift+s to reload the app at any time. Click the Green Play button to run the app. In this example we are using the iOS Simulator. This is what you should see upon loading the app. Let’s begin implementing the carousel feature. Your body value will be replaced with a Stack that has two children: a PageView and a ListView. 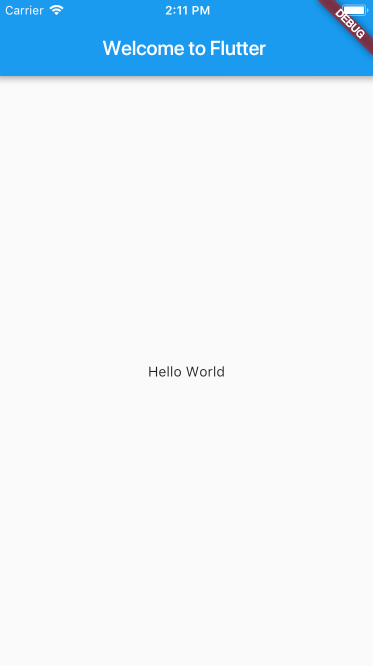 The PageView will handle our background image, while the ListView holds our “Hello World” text. Of course, testBGCarousel does not yet exist. In order to load an image into the background, we will have to create a new asset folder. Right click on the project folder and select New > Directory. You can name the directory “images” or something comparable. You can grab three background images at random for the purposes of testing. I like to format them ahead of time so they sit well in the app. Consider using 1000x1472 px with 72 dpi .jpg format. Place these images into the images folder that you created. Download these three images and use them to test the carousel. The aforementioned ListView is set up with a single child argument of new Text. I am featuring the ListView here as a placeholder, simply to demonstrate where you would place your list of widgets that sit on top of the PageView. ListViews can hold any variety of children, including Images, form fields, buttons, and so forth. The Children List: You can add as many AssetImages as you want, provided you keep the correct format. Follow the syntax shown above to access the .jpg files in the image folder you created. Note that arrays are called lists in Dart. The Map Method: Mapping is similar to a forEach loop; it takes each element of a list and performs some action. You can read up on Dart’s map method here. We are mapping over the list of AssetImages one at a time. The first argument (bgImg) holds the value of the current AssetImage. Next, the fat arrow (=>) executes a function where the value of bgImg is positioned within a new context. That context is the new Image(…).toList() statement. Each New Image: The first property, image, receives the mapped element bgImg as a value. Additional properties are assigned. Note that I am using fit: BoxFit.cover to automatically fit the images within the box. The large width and height values ensure image scales into a large enough space. Once the new Image is created, the .toList() method pushes that image to a new version of the Carousel’s children List. To customize animation duration and curve, command + click on the property names to view your options. When you know what you want, you can add the new properties following the displayDuration format shown in the testBGCarousel example.